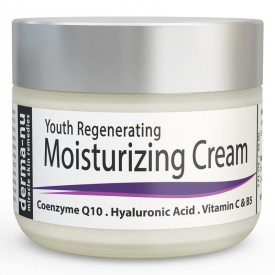 Derma-nu Youth Regenerating Moisturizing Cream is a daily non-greasy moisturizing cream built with powerful natural antioxidants to help improve cell turn over and hyaluronic acid to boost collagen, this moisturizer is a powerhouse of youth to keep you looking young and refreshed! * PERFECT FOR ALL AGES & SKIN TYPES - A blend that is gentle on even the most sensitive skin, making us something for everyone’s wish list! No matter if you’re a man or woman, this infusion of vitamins and clinically proven ingredients are exactly what your skin needs to look beautiful! 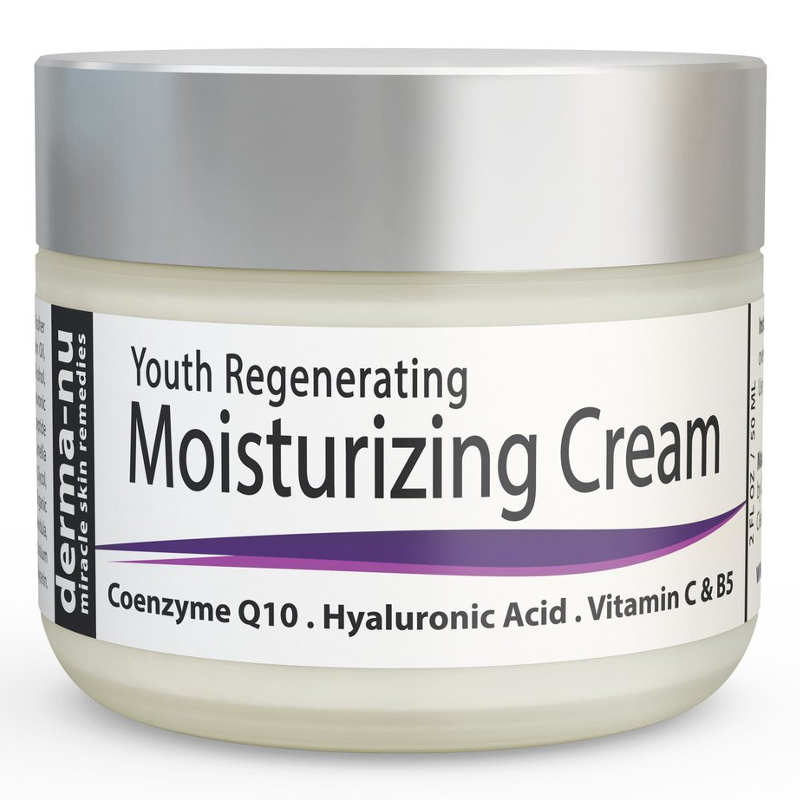 * LOOK AS YOUNG AS YOU FEEL - This innovative moisturizer helps to “plump” your skin, reducing the look of aging by reducing wrinkles, fine lines, and crow’s feet. It’s taking YEARS off of your appearance, quickly leaving you feeling rejuvenated inside and out! * FREE FROM HARMFUL CHEMICALS - Naturally scented products using only all natural & organic ingredients like jojoba and coconut oil, MSM, & more to offer you more for your money naturally. Avoid the chemical filled riff raff, and stay young with Mother Nature. 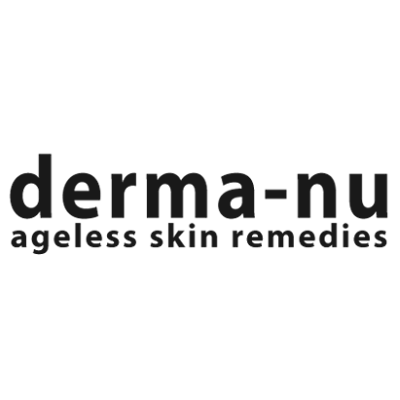 * PROUDLY MADE IN THE USA - Buy with confidence that all of Derma Nu’s products are carefully blended right here in the United States. In fact, we’re that confident that you’ll love our product that we offer a money back guarantee on all our goods. Apply over face, neck and decollete. Best if used twice daily, morning and at night. Aqua (Deionized Water), Aloe Barbadensis Leaf Juice (Organic Aloe), Glycerin (Kosher, Vegetable), Glyceryl Stearate, Cetyl Alcohol, Caprylic/Capric Triglyceride, Cetearyl Alcohol, Coco-Caprylate/Caprate, Helianthus Annuus Seed Oil (Organic Sunflower Oil), Glycolic Acid, Ethylhexyl Palmitate, Cocos Nucifera Oil (Organic Coconut Oil), Stearyl Alcohol, Squalane (olive oil based), Theobroma Cacao Seed Butter (Organic Cocoa Butter), Beeswax, Simmondsia Chinensis Seed Oil (Organic Jojoba Oil), Camellia Oleifera Seed Oil (Camelia Oil), Oenothera Biennis Oil (Evening Primrose Oil), Persea Gratissima Oil (Avocado Oil), Calophyllum Inophyllum Seed Oil (Tamanu Oil), Rosa Canina Fruit Oil (Organic Rosehip Seed Oil), Vitis Vinifera Seed Oil (Grapeseed Oil), Panthenol (Vitamin B5), Sodium Ascorbyl Phosphate (Vitamin C), Tocopheryl Acetate (Vitamin E), Tocopherol (Vitamin E), Ubiquinone (CoQ10), Cassia Angustifolia Seed Extract (botanical hyaluronic acid), Dimethyl Sulfone (MSM), Helichrysum Angustifolium Flower Oil (Helichrysum Essential Oil), Cucumis Sativus Fruit Water (Cucumber Hydrosol), Citrus Aurantium Dulcis Fruit Extract (Lime), Camellia Sinensis Leaf Extract (Organic Green Tea), Pyrus Malus Fruit Extract (Apple), Saccharum Officinarum Extract (Sugar Cane), Citrus Aurantium Dulcis Peel Extract (Orange Peel), Cucumis Sativus Extract (Cucumber), Euphrasia Officinalis Extract (Eyebright), Glycyrrhiza Glabra Root Extract (Organic Licorice), Mahonia Aquifolium Root Extract (Oregon Grape), Potassium Stearate, Cetearyl Glucoside, Lactobacillus/Lemon Peel Ferment Extract, Sodium Carbomer, Caprylyl Glycol, Cocos Nucifera Fruit Extract, Hydrolyzed Jojoba Esters, Lysolecithin, Phenylpropanol, Propanediol, Pullulan, Sclerotium Gum, Sodium Hydroxide, Sodium Phytate, Xanthan Gum, Phenoxyethanol, Ethylhexylglycerin. I have bought this a couple of times and find this a good day and night moisturiser. * MONEY BACK GUARANTEE! If you aren't completely satisfied in that time, just send it back our way for a full refund! 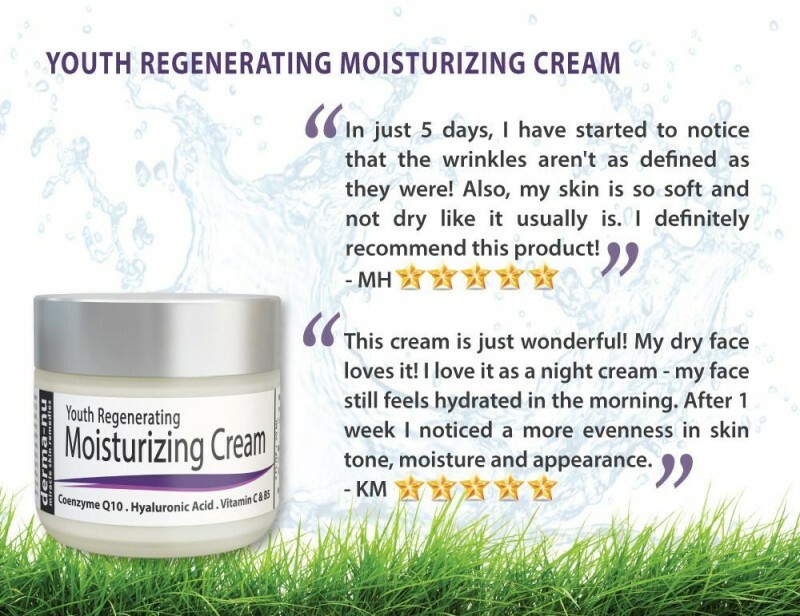 "I have bought this a couple of times and find this a good day and night moisturiser."